Motorbuses were first operated by Ipswich Corporation as late as 1950. The Corporation operated trams until the 1920s replacing them with a fleet of trolleybuses up until the first AEC Regents arrived in May 1950. The bus scene in 2017 is still quite ‘traditional’. Ipswich Buses are owned and operated by the local council and the ‘company’ buses are operated by Firstbus as First Eastern Counties Buses Ltd. Of course the liveries are vastly different, Ipswich Buses run in a striking purple and lime green with white trim scheme and the First buses are in the latest corporate style but with a dark blue-grey front third with the fleet name of ‘IPSWICH’ in large white letters. Vehicles in the Ipswich Buses fleet are varied and interesting. Double-deckers include Dennis Tridents with Alexander ALX400 and Plaxton President bodies, from both London and Edinburgh. Other double-deckers include East Lancs bodied DAF DB250s and Scanias with both East Lancs Omnidekka and Optare Olympus bodies. Single-deckers include the Scania OmniCity, ADL E200, E300, and Dennis Super Darts with various styles of East Lancs bodywork. There are also Dennis Darts with Alexander ALX200 bodies, Optare Versas and new Mercedes Benz Citaros. Adding further interest are some vehicles in the former Carters fleet livery of red, yellow and black. Most First buses are Alexander ALX400 double-deckers and Wright bodied Volvo single-deckers. Our filming takes place in and around the town centre. Beginning at the Tower Ramparts Bus Station, used mostly by Ipswich Buses, we move around the town in an anti-clockwise direction. Filming in High Street, Museum Street, Princes Street, Friars Street, Dogs Head Street and then taking in the Cattle Market Bus Station, which is used mostly by the First buses. From here we film in Upper Brook Street and Crown Street, which returns us to our starting point – Tower Ramparts Bus Station. All types of buses are seen in action running around this picturesque town. We now take a look at some archive video from the camera of Malcolm King. Filmed in 1991 at the Tower Ramparts Bus Station, we see Leyland Atlanteans, Dennis Dominators, Dennis Falcons, Optare Metrorider and the rare Alexander bodied Bristol B21 single-deckers operated by the Corporation. We go further back in time to 1977 with some stills from our own archive of the Roe and ECW bodied Leyland Atlanteans, a Massey bodied AEC Reliance of the Corporation and the ECW bodied Bristol REs, LHs and a Bristol Lodekka FS of the National Bus Company incarnation of Eastern Counties. 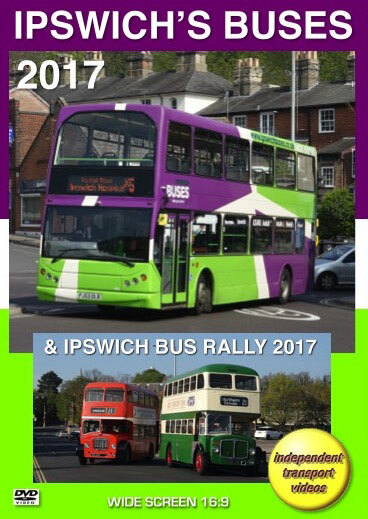 The final part of our visit to Ipswich brings the past to life with footage filmed at the Suffolk Bus Preservation Group’s ‘Ipswich Bus Rally’ that took place at the large car park adjacent to the Ipswich Town football ground on Sunday 9th April 2017. Most of the participating vehicles had a connection with the town and area, but there are some ‘gems’ from further afield for you to enjoy! We film the arrivals of the buses and coaches and then take a ride to the superb Ipswich Transport Museum on board former Ipswich Borough Transport 63 (ADX 63B), a Massey bodied AEC Regent V. Our cameras take a look around the museum where we see a former Corporation tram, trolleybuses and buses together with a Bristol L and K type from the Tilling era Eastern Counties fleet. We take a ride on RL516 (EPW 516K), an Eastern Counties Bristol RELL6G and a former Eastern National Bristol KSW5G, of which both types would be familiar to the streets of Ipswich. The event also featured an ‘ECW Gathering’ with a line up of some 12 ECW bodied buses and coaches. Our cameras continue to film the action on and around the rally site as well as the departures of the vehicles as the event closes. We hope that you enjoy your visit to Ipswich as much as we did filming it for you!